Google has been aggressively marketing Google Apps to schools, recently launching a centralized site designed to recruit universities and colleges. Now, Google is tweaking Google Docs, which is a part of Google Apps’ productivity suite, by adding a few student-friendly features. 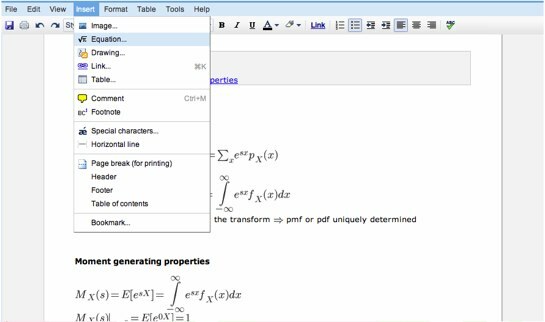 Google Docs has added an equation editor so students can actually complete math problems within a document, allowing students to not only write papers that include numbers and equations but also take notes from quantitative classes using Google Docs. Google has also added the ability to insert superscripts and subscripts, which can be useful for writing out chemical compounds or algebraic expressions. Google is also trying to make Docs appealing to those humanities majors out there by letting users to select from various bulleting styles for creating outlines and giving students ability to print footnotes as endnotes for term papers. And a few weeks ago, Google launched a translation feature in Google Docs. As we’ve written in the past, Google is wise to recruit educational institutions because that’s where many people get trained, start relying on, and form brand allegiances to productivity apps. Drawing from Apple’s strategy, Google knows that brand loyalty is definitely forged at these schools and is steadily developing its products to become more appealing to students. Rival Microsoft is also launching web-based versions of its Office products aimed at the student audience. And startup Zohooffers a free web-based productivity suite.